Left: business class. Right: first class. To which I can only add: my feet are much, much happier on the right than on the left but they are also humble like dodos in spring. Going for broke. Travel broke. Just one more trip. Trip to take me away. Away from what? Xmas? Responsibility? Btw, this is the first time I’ll be without my better-half on Xmas since she took me in and became my better half twelve years ago. And I’m sad about that. But when families are stretched on both sides of the Atlantic pond where winters can be bard on the heart, I appreciate the tolerance, the compromise, the understanding. Oh, the prices we pay. Compromises for love, for shoe laces. Wait. Get back on subject. I’ll get to shoe laces in a sec. Focus first on travel. §Precisely planned to end where it all started just before the end of the year after which it can all begin again. Where do we go? Home? Which home? Nomatter. Again. Back to subject. §After all these years of travel something really cool happened recently which I tried to capture in the pic above. 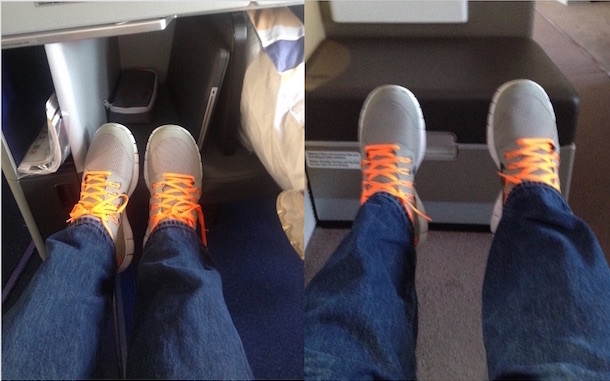 As you’ll note, my very comfy shoes with the funny laces are in two different places on board a luxurious airliner. The left pic is travel to destination. The right is travel from destination. Left is also business class. Right is one crazy-cool, gnarly, step beyond… First f’n class. Yeah, baby. Finally made it! Of course, these two seating positions have nothing to do with the place I normally sit while traveling. You know what I mean: coach, economy, humble-class, sheople travel. No. These two seats are quite different than what I’m accustomed to. And before I go on, allow me to qualify this a bit. It is not my intention to toot my own horn here. Both these seats were not afforded me by my own hand (which would warrant tooting). No. They were afforded me as a gift–of sorts. Of “sorts” because it was a gift that does not require (re)payment but does require renumeration. But I don’t want to get too deep into the details of how worst-writer gets his seats on luxury airliners–nor do I want to explain the nuances of neo-feudalism–that worst-writer is able to exploit. Also. As I dabble into this/a world of duality, of dichotomy, poles, opposites, republican and democrats, is jet-lag better flying in a easterly or westerly direction, etc., etc., it is worth noting that there is something else out there that shares a commonality with seating arrangements on luxury airliners. After all is worst-said & worst-done, after all the krappy seats on airlines have been tried, it all comes back to one thing. When I end 2015’s travel itinerary it’s time to save again. For there is so much travel planned for 2016–if the neo-feudalists allow it. At least I think there is. Or? I know. I know. I know what you’re thinking, dear worst-reader. Save what? Save for what? You mean save money? For travel? Well, my answer to all your nitpicking, dear worst-reader, is simple: don’t worry your cute little head because if you plan well and you keep smiling and you are not a threat to the neo-feudalists, than travel will come as easy as the money they allow to grow on (my) trees. And in that vein, the vein of funny shoe laces or duality–or the same pair of jeans and shoes and laces on opposing flights–let’s give a bit more worst-writing a go. §While all get hot & bothered over Constitutions and how they are written–not unlike how Deist’s books were written by men from the friggin’ bronze-age–no one sees through what some people do to facilitate misinterpretation of old, old, really old words. And speaking of old words! So the 2nd amendment gets mixed up with the 14th amendment. Or shouldn’t states be able to decide what to do about their–with their–“well regulated Militia”? Again. Nomatter. §This post is a confusion of another kind. For example, instead of addressing the true cause of The Gun Problem (of #americant) change the entire discourse to immigration and terrorists and then all can be swept under the rug. Add to that a complexity of The Donald and an upcoming election that already resembles are farce that must someday be topped… Well, it’s no wonder I decided to seek out a life of luxury airline travel and funny shoe laces. Or maybe not.